Most recent footage of two Russian camera teams provide unique and revealing insights into the current ground property situation and the course of the battles in Vuhlehirs’k. 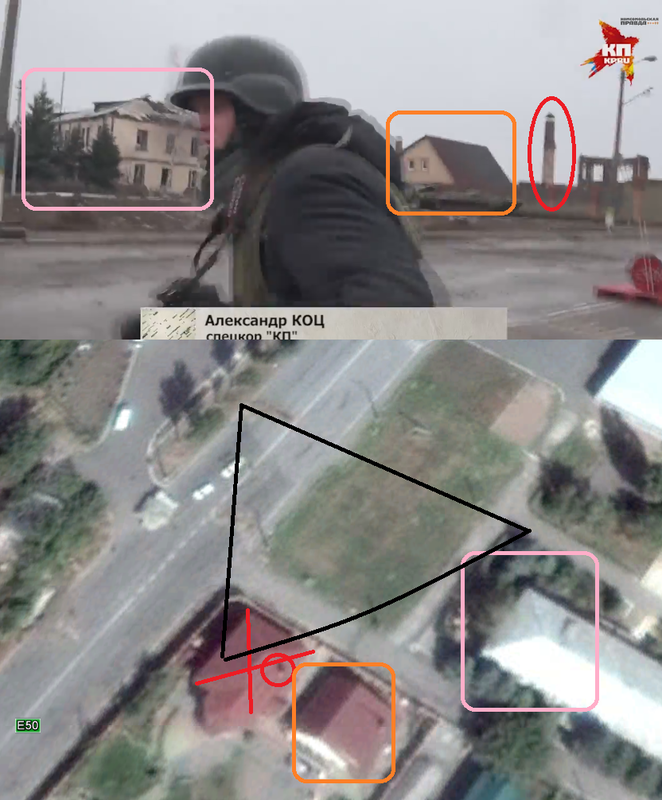 To understand the latest development in the battle for the town and give an (as most as possible) objective picture of it, I geolocated all available footage piece by piece, gaining insightful and partly surprising results. The first footage is mainly located in the very south west of the city, only 100 meters from the town’s entrance sign along the M04 / E50. The camera team met the Russian troops at the N-W former Ukrainian army checkpoint. The next scene shows them approaching the M04 from the east, coming from a small street and not the main road, which would have been the fastest way. This way seems not to be safe to walk. They are crossing the M04, running and obviously afraid of snipers in the area. Only when seeking shelter in some of the buildings nearby, they (the Russian media guys and soldiers) relax. As soon as they enter an open area with a wider sight line, they almost panic, being sure, there are Ukrainian forces in the area. Another scene shows them returning to the east of the city, starting on the other side of the read, this time with the gas station in the background. There is not much shooting audible, but the situation seems tense nonetheless. 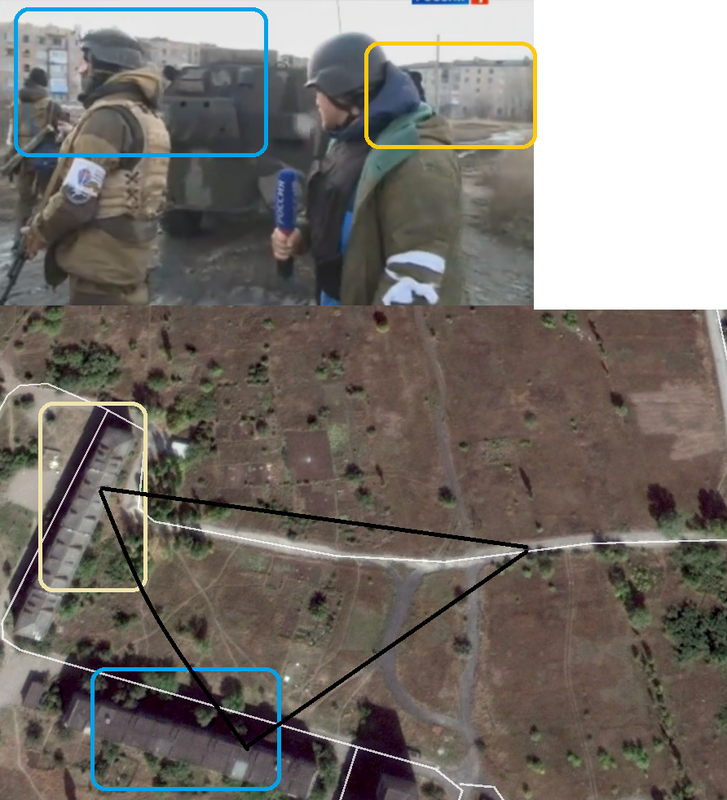 During the video, a former Ukrainian position as well as one to two dead Ukrainian troops can be seen but also seemingly disabled Russian vehicles, namely a BMP-1 and an Ural truck. 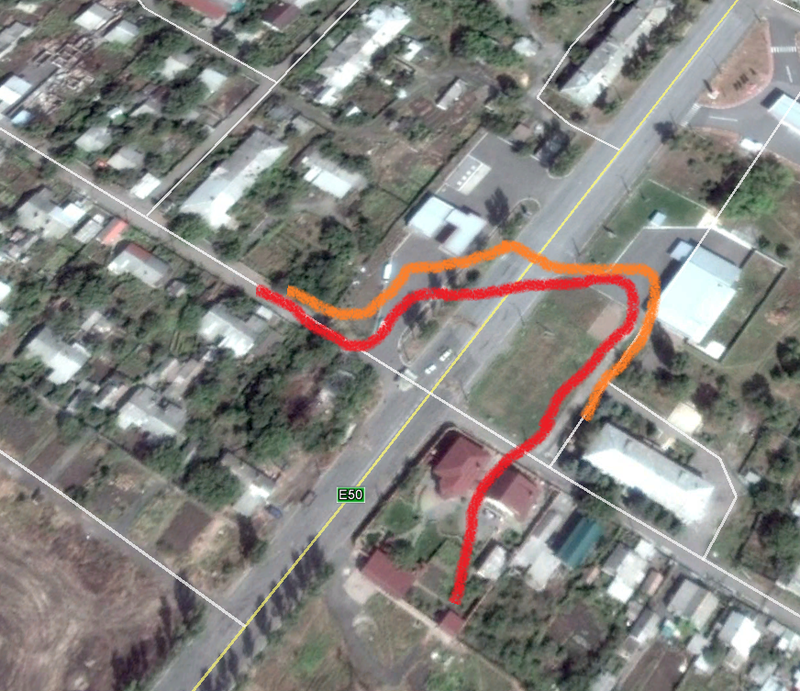 I mapped the entire ways, the footage shows with the “outbound trip” marked in read and the way back marked in orange. 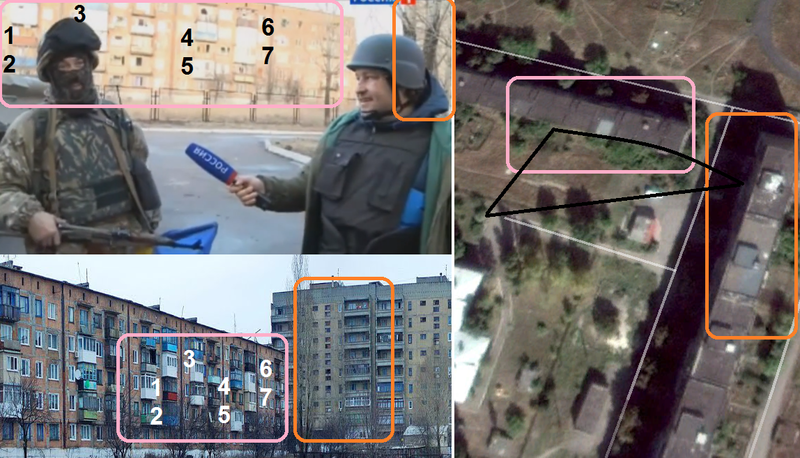 Another Russian state TV team is filming in the geographical center of the city, being embedded with Russian troops, storming and Ukrainian army observation and sniper position in the highest residential building of the town, situated among the only agglomeration of large apartment blocks in Vuhehirs’k. The first scene is a brutal as unsurprising with a RF armed forces T-72 firing shell after shell into the eleven-story building, making sure, Ukrainian fire from the building ceases before the further advance. Shortly after, Russian ground forces advance towards the apartment block from the north, using classic motorized infantry cover tactics, moving within the protection of a BTR-80. After arriving between the high rise buildings, they enter the buildings searching for surviving Ukrainian troops. There is no shooting audible, so those troops might have fled or be dead by then. Finally the officer of the Russians is interviewed. I marked this picture as it was my starting point of geolocation (comparing it with a picture from the same house on Google Earth). 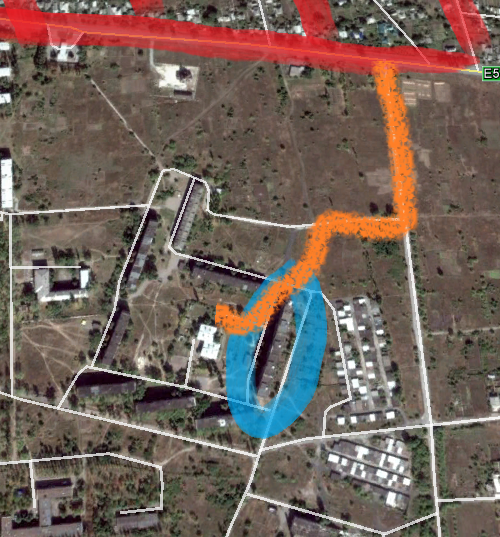 The final map geolocates the entire path the Russian troops took to approach and storm the apartment complex, revealing further insights into the who owns what across the city. What does all this tell about the current situation in Vuhlehirs’k? Mainly that the tactical situation is much more complicated than previously thought. 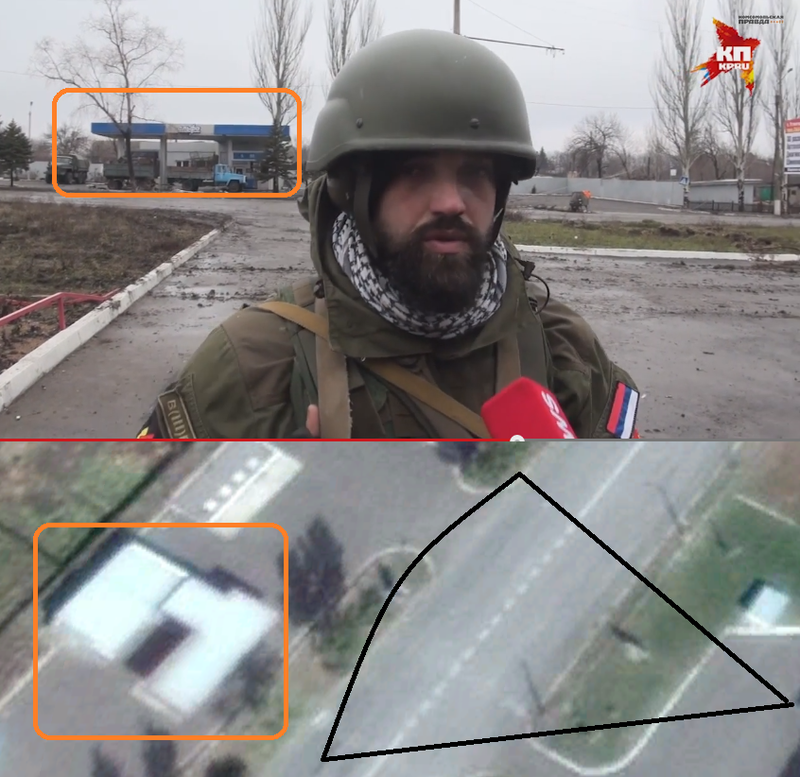 The Ukrainian claim that they recaptured – or rather: re-infiltrated – many areas of the town after January 30 seems to be accurate and the Russian narrative of “full control” proven wrong (by their own footage). At the same time it can be once again concluded that Ukrainian troops in Vuhlehirs’k are severely outgunned, outnumbered and generally in a rather defensive position plus losing territory – once again, one might say. While Russian forces use BMP, BTR and main battle tanks inside the city limits, Ukrainian troops seem to rely on light vehicles (as can be seen in the footage) and light infantry units. Finally the above and previously analyzed footage from earlier today allows to create a very current and much more founded map of today’s ground property situation among the involved parties. It shows that the situation is more complicated than 4 days ago when Russian forces controlled 90%-100% (also admitted by Ukrainian govt sources) and Ukrainian reinforcements have indeed entered almost all parts of the city. However, it also shows, they are under serious threat of losing it once again. Also the fact that Ukrainian troops seem to be mainly located in the center and southern part without heavy weapons or a stable resupply line contains the great threat of another encirclement by getting cut off from the main force in Debaltseve to the east and Artemovsk to the north west… The battle for the town continues. This entry was posted in Ukraine and tagged Donbas, Invasion, Russia, Ukraine, Vuhlehirsk, War by Julian Röpcke. Bookmark the permalink. You make one mistake in you analitic. Russian press(especially war correspondents) in most cases make public combat footage with 3 day delay to not uncover critical information for the enemy. And second video caption suggest that its about initial battle for the city, not current situation. I think you are wrong. Look at the weather and especially melted snow. It’s from today when the fighting decreased for some hours. 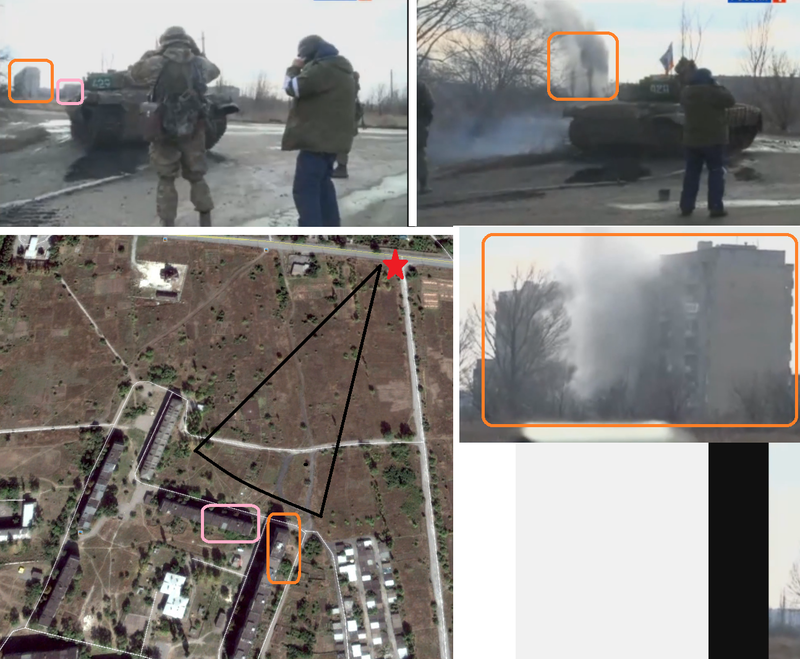 Take this footage of Chernochino, where 20 ukr soldiers are encircled. 1) Regarding weather conditions, it’s clearly not from the inital assault (no snow, overcast but not foggy). It’s also consistent with the videos from the civilian evacuation. However the video from building assault, seems to be from another day (sunny or partly sunny day). (8:32) M04/Nekrasova street facing east, you could see another turetless tank, and journo filming in the middle of the street. Apparently it’s a safe direction. The location could be identified with the help of this picture https://ssl.panoramio.com/photo/57712495 showing almost the same perspective (coniferous tree). Honestly I think you should fix your terms. Generally writing “russian troops” doesnt make you credible. My friends there tell there are lots of russians fighting, but more like 60-40 in relative to ukrainians. If you look at the videos and see these old men and you call them russian troops… not credible dude. Check this out. All their commanders say 75-90% are Russians. 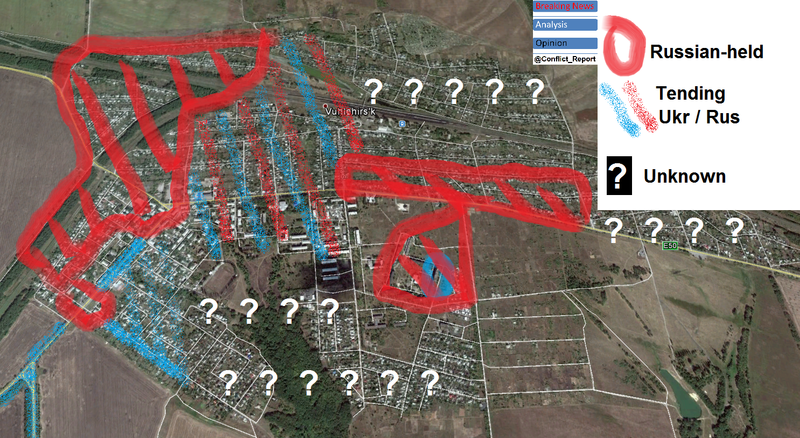 https://twitter.com/Conflict_Report/status/562643638854107136 And in Vuhlehirsk, it’s the Russian army – only. Dude stop calling the separatists Russian Army.They are not the Russian Army.If we are realistic these guys are mostly locals backed up by some Russian army Special Units to operate heavy equipment.If the Russian Army was involved as a whole(Air Force,Ground Troops,Missile Forces,Navy)The UAF(Ukraine Armed Forces) would have been destroyed.I mean they are after all fighting with Russian weapons that Russia made they can destroy them in a few days.The UAF Air Defense is not that impressive and the Russian Air force has well over 4000 aircraft that can wipe them out in a week.Without AA ground troops will be left to the mercy of the Russian Air force.So please call these guys what they are> Russian Backed Separatists. Perhaps the whole footage (second video) is posed for the journalists. In my opinion the scenes a part of these event: https://www.youtube.com/watch?v=7g05kXeULis. There is a scene when civilians are crossing without any fear while the same time the separatists/russian forces behave like in a combat situation (3:30). At the end of the video they are storming the apartment building from your footage (second video). Do you have ANY point?! I was right then and am right now. Solid work from an objective standpoint. But…. is this really the best use of your time & effort? Attempting to parse out the details of an extremely fluid & changing battle yet relying on the *extremely incomplete* whims of whatever footage emerges… who does it really serve? How does focusing on this very specific & dynamic minutae enlighten us in the short or long run? How does the conclusion – backing up what we already thought we knew – help readers better understand the conflict, which is the ultimate goal of reportage aside from simply bearing witness? I’m just thinking out loud here. I have to suspect that similar efforts applied selectively to other aspects of the conflict (assessing troop movements, manpower, supply, etc) might provide more valuable insights. Not trying to put down your work – it’s largely very very good – just speculating on the long-term value of what you’ve chosen to focus on, and thinking maybe you haven’t quite found the niche to make this stuff a really significant contribution. Almost there though, and I hope you’ll find it. Incredible journalism. Your reports are hours or even days ahead of everyone else. I do beleive there are bonafide Russian Army soldiers in Ukraine. But dont you think the Ukrainians would have captured a few more since those 10 paratroopers in the fall? Why arent they showing them prove the point?